One the most common challenges startups and small business owners face is overcoming a significant lack of time and resources. As a small business ourselves we know that there’s so much to do, and so little time to do it in. Because of this SEO for your website can often be thought of as a ‘nice to have’, something you only get around to when you finally get some free time and a bit of extra budget. However, it’s important that you don’t dismiss the important role that SEO plays in your businesses success online in 2017. Studies reveal that search engines are still the primary source of research for consumers looking a new product or service. 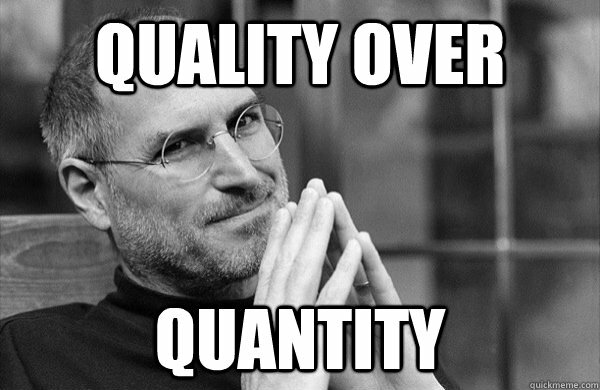 So don’t think of SEO as a chore, think of it more as an investment into the future growth of your company. If you’re short on marketing budget here are some low-cost ways to build your online presence. There are over 200+ different factors that Google consider when they are making the decision on which website’s to list when someone searches for something. Damn straight, that’s a lot of moving parts you need to get your head around – plus don’t forget to add into the mix that not all 200 factors are equal in terms of how important they are to Google. So start by focusing on completing a small number of high impact SEO activities. There’s so much information out there about the hundreds of different things you can do to your website, many of which are written by experts and are difficult to decipher. How do you know if what they are telling you do is it important or not? Create an SEO plan for your website that starts with the basics – don’t make the mistake of underestimating the impact small changes can have on your online presence. 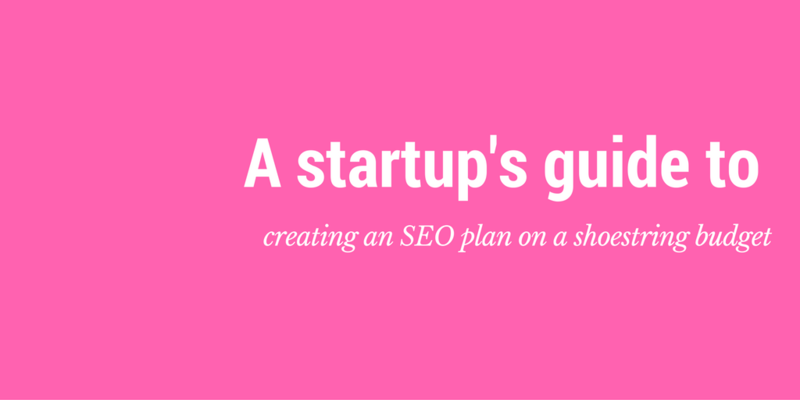 Try using an SEO tool like Glasshat – that scans your website to generate a prioritised SEO plan, specific to your website. Get started at the top of the list and work your way down. Every successful SEO plan starts with picking the right keywords to target. 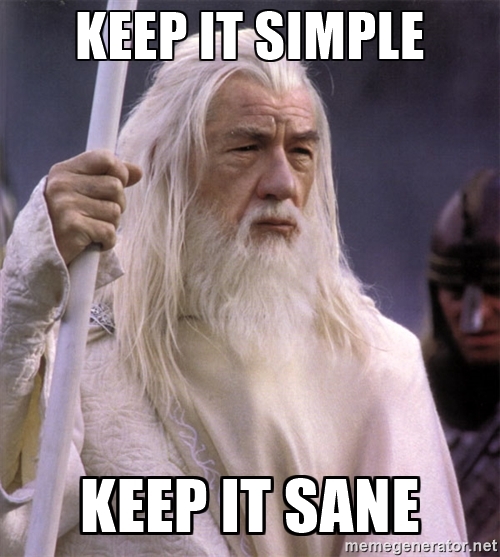 But, if you’re new to creating SEO plans, it’s important to remember that not all keywords are equal. The thing to note here is how competitive a keyword is. 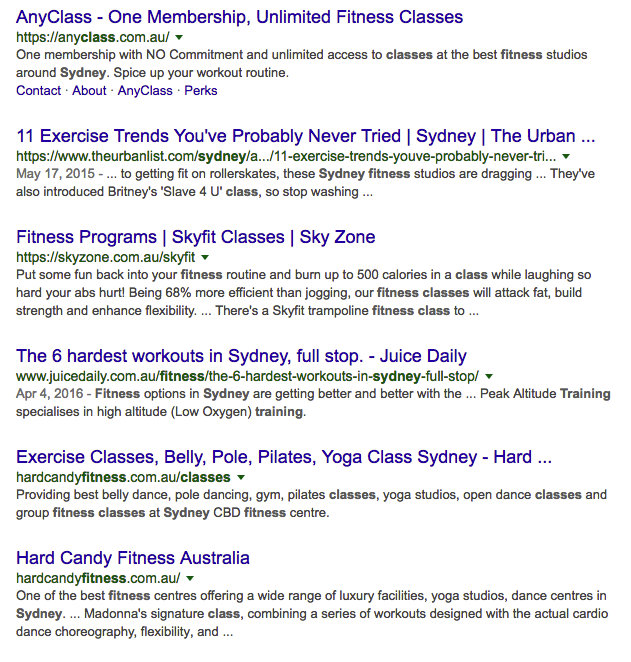 In reality if I started a business that hosted fitness classes in Sydney and I wanted to appear on page one I’d have to invest a huge amount of time and resources if I wanted to even stand a chance at appearing next to the likes of the big gyms like FitnessFirst or Hard Candy Fitness. If you think you’ve found a keyword that suits your business try searching for it online. Look at who already ranks. If the top 10 brands are taken up by big brands then it’s likely that ranking could take years of work and a whole heap of investment. So when you’re doing your initial keyword research always check who already ranks highly in the search results. Be targeted and Specific – Segment your customers into groups and make sure you have keywords that are specific to them e.g. “fitness classes post injury” or “group fitness classes for women”. You have a much better chance of people clicking through to your website and finding the information they were looking for. Long-tail – short tail is when just one or two generic keywords are used in the search e.g. “fitness classes”. An example of a longtail search phrase contains three + keywords e.g. “fitness classes in newtown” or “fitness classes for women over 50”. Think about what’s happening outside of your website. It’s easy to create an SEO plan that only concentrates your effort on your website – after all your website is something that you log into and easily make changes to. However, you need to know that Google also cares about who is talking about, and linking back to your business from other places on the web. The easiest way to think of it is to look at a link or mention of your business as like a vote for your website. The more votes your website has, the better chance it has at appearing. Add your business to local listing websites with full details of business name, address and phone number. Get links and mentions on local websites such as local community websites, newspaper, radio or local chamber of commerce. Running your website through an SEO tool will generate a list of a easy and low cost ways you could achieve this for your business – many of which jump on the back of things you’re already doing for your business. Give it a try for free here. Start simple with a short list of high impact things to do. Be targeted and specific and think about the longtail. If you have a physical location make sure you add the location to your keyword phrases you’d like to target. Take the time to ensure that everywhere you are listed online as a business has the right details.